The aliens have landed! 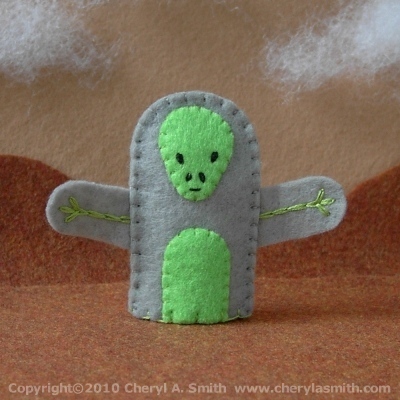 This little guy has a grey body with a lime green face and belly. He has a sweet disposition and promises not to conduct any funny experiments. Each of my finger puppets is hand embroidered and stitched in polyester felt from an original pattern. Each puppet body measures approximately 1-1/2 inches by 2-1/2 inches and will fit most fingers. No glue is used in the creation of any puppet. Everything is firmly stitched in place. Each alien is an individual - so facial expressions and stitching may vary slightly from photo.